The ideal solution for making a device connection from within your device cabinet. The panel mount cable has a USB Type-A female connector that helps convert your connection from USB-C to a conventional Type device connection. High quality USB Type-C Male to USB 3.1 A Female panel mount cable. 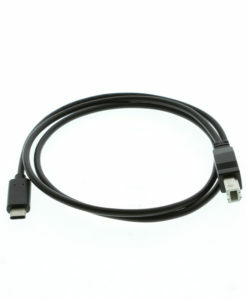 This panel mount cable serves as a gender changing connector between a USB-C host and Type-A male connection. The USB Type-A Female end is secured to the cabinet wall from inside or outside to make your USB-A male connection. The USB Type-C to A Female panel mount cable is ideal for conventional USB device connections to new PC or laptop Type-C machines. Included with the panel mount cable are the screws necessary to secure it tightly to the cabinet wall. It supports data transmission of 5Gbps with its USB 3.1 super-speed specifications.